Providing Mechanical, Electrical, Plumbing and Fire Protection (MEPFP) services isn't all calculations and technical information. It's about clients, architects, contractors and other design team members interacting and working together to develop and build out a project. At BD Engineering, we pride ourselves on treating our projects not just as jobs, but as partnerships. We can provide for all your project management needs, taking them from initial concept through design and bidding, and providing supervision throughout the construction process. Our project managers have over 30 years of engineering experience enabling us to better understand the bigger picture of the construction process, improving project turnaround and minimizing change orders during construction. We have proven experience in the construction of large box retail, new stores, takeovers and renovation projects nationwide. BD Engineering can provide the support you need to make your construction/renovation projects smooth, painless and economical. We offer a "one-stop shopping" approach to your engineering and construction needs. 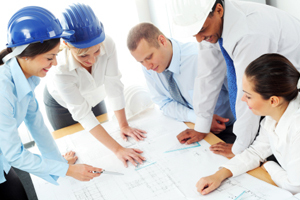 Rely on us to make your projects a success and allow you to focus on your core business.